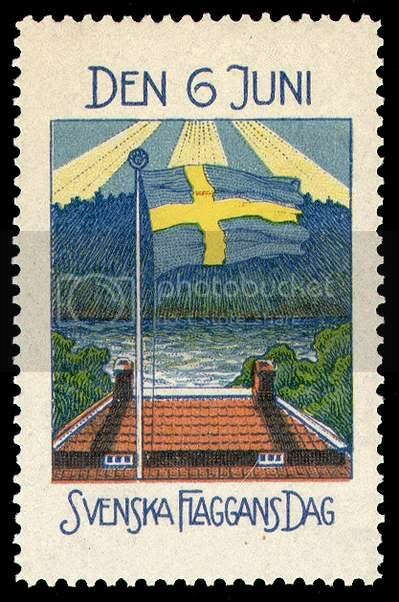 The blazons of the 24 provinces were illustrated on Swedish post stamps. These stamps were sold on reduced prize, with a limit of 2 books of 20 stamps each per family. They could only be used on letters to Sweden, Denmark, Finland, Iceland or Norway. Source: Yvert et Tellier (YT) stamp catalogue. Band 3. Stamps from Western Europe (incl. Scandinavian countries sensu lato). 1992. Just as a curiosity, the swedish flag on a Swedish Flag Day seal (seal is a non-postal stamp, also known as a "cinderella" stamps). Here :http://i168.photobucket.com/albums/u190/warm4/c71b61d4.jpg.